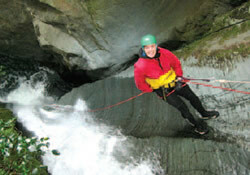 The Wanaka region is New Zealand’s premier outdoor adventure area and the canyons here are no exception, with a range of world-class canyons on our doorstep. 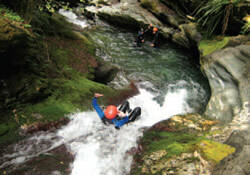 World class canyoning on the road to Mt. Aspiring. Beautiful canyons, hands-on challenges, great-big FUN in small, personal groups! True wilderness feel in the heart of Mount Apiring National Park - a World Heritage area. Limited numbers and exclusive access make these canyons something special. Magnificent canyons you will never forget. COMBO DEALS - Discounted trips when you become a ‘repeat offender’! Contact us directly. Below is a rough guide as to the difficulty level of our trips and who they’re for. Be aware that at times of high water flows, all trips become more difficult. Click on the photo or read more link to check out the canyons in each option.